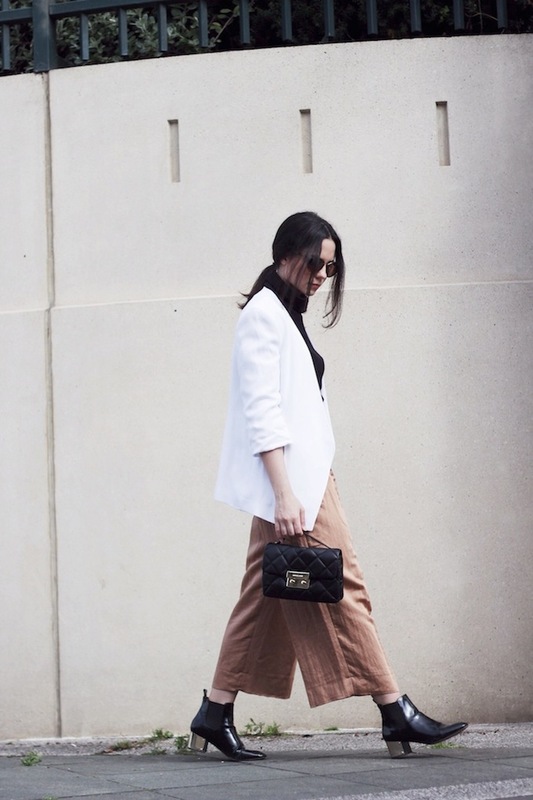 What you think of culottes? I hear lots of ladies saying they look disgusting. Personally, I think they simply don't know how to wear them. Today I want you to have a look through my favorite 7 styles to wear with your everyday clothes. This voluminous short bottom garment, known as gauchos might be quite tricky to style, but as you all know there is nothing impossible in this world. The trick to pulling them off is to think of them as of an A-line skirt. Once you imagine an A-line midi skirt, everything changes. That's an office friendly look. We see white long-sleeve pullover paired with grey wool culottes and pretty cuffed black closed toe sandals. There are many voguish ideas to follow. You can tuck in your favorite blouse, layer it with an office friendly blazer and add a great pair of heels. Of course, if you are new to these bottoms, then it's better to stick to basic colors, like navy, black, white. This is a must-try design, what can be worn from the streets to work. These pants are officially “It” silhouette of this year. The best length is midcalf, while if you are a petite girl, then you better opt for the ones that fall right below the knee. Speaking of shoes, then I suggest you to keep things ladylike and go for pointed-toe pumps with slim high-heel, but you can try on thick-heeled platform booties styles. Play with proportions. I love to wear high-waisted culottes with crop tops. Read on for my tips for culotte on how to make them work perfectly for you.